John passed away suddenly at the Dr. F.H. Wigmore Regional Hospital following cancer surgery. He was born in Saskatoon, SK, the youngest of the four children of William and Dolina McPherson, who predeceased him in 2005. 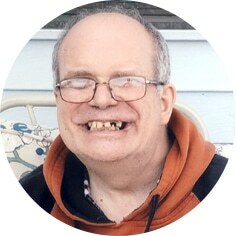 John is survived by his eldest brother, Don McPherson (Diana); sisters, Barb Smith (Ken – deceased July 2018) and Dolina (Ross) Watson; as well as his nieces and nephews, and great nieces and nephews: Sheri (Sheldon) and their children Zak, Matt and Alec, Chad and his children Jordan and Jaicee, Ken (Jackie) and their children Keenan and Jessica, Kathy and her children Lachlan and Ada, Angus (Cassie) and their children Abigail and Emily, and Heather (David). John has been part of the Citizens All Association family for almost forty years, with his longest and most recent residence at Hochelaga House. He attended Diversified Services, participating in a variety of tasks. John was a very happy soul who will be missed by all whose lives he touched. We would like to thank the Surgical Ward Staff for John’s care during his stay. John’s family would like to thank the Staff at Citizen’s All for the love and care they gave to our special brother John. A Celebration of John’s Life will be held on Friday, February 8th, 2019 at 2:00 p.m. in the Harvey Room at Moose Jaw Funeral Home. Flowers are gratefully declined. As an expression of sympathy, donations in memory of John may be made to Citizens All Association Inc. Head Office, 410 Hochelaga St E, Moose Jaw, SK S6H 0P3. Online condolences may be made at www.moosejawfuneralhome.com. Arrangements are entrusted to Moose Jaw Funeral Home, 268 Mulberry Lane. Michelle Surtees Funeral Director 306-693-4550. My heart is saddened by Johns passing..I was one of his Care Providers at Citizensall..Hochelaga House..he will.be greatly missed..his smile , his very friendly hello.to me at the house ..joking around and nice hugs..and also him dancing around to.music ..hard to believe he is gone..
Much love to his family and many others . John will be missed. He was a valued part of our Citizens All family. My wife and I as JW would like to share our sympathy to all in the family. Also we would like to share some answers from the Bible on the subject call death. (1) ? Why do we face the subject called death ? Ans, is given Romans 5: 12. (2) ? Is it possible to see our love ones alive again? I am saddened to hear of John’s passing. He was a lovely part of my childhood. Johnny was my cousin and only a few years younger than me. He was my first human relationship with an individual different from myself and his presence in my life taught me a multitude of lessons I did’t even know I was learning at the time. I remember with fondness, his sweetness, his gentleness and his smile… always smiling. John, your presence on this earth, for as long or short as it was, touched me as a child and I imagine others as well. Johnny sweet Johnny, I will miss you. We were very sad to hear the news of John’s passing. He always had a smile for everyone unless you told him to turn down his Mrs. Mills records which he loved dearly. Our condolences to Don, Barb & Dolina and all their families. Our thoughts & prayers go out to all John’s family, Don, Barb, Dolina and families as well as his extended family at his Hochelaga home. All will miss his smile and his joyful personality. As a cousin he is remembered as a very loving, friendly & joyful soul. Yes our lives will go on but they have forever changed, never to be the same. We will miss you John but you will continue to be part of our lives in memory. Fare well good & faithful friend. Take care all of you & God be with you as you grieve and say “Fare Well” to John (Johnny Mac).